Charlie Bears Dusk Discounts Apply ! From The 2017 Plush Show Special Collection, Designed by Heather Lyell. The final bunny design to finish the miniseries is called Dusk. Created in a tonal tipped plush fabric in a selection of summer evening greys, he has deep black faux suede paws pads and inner ears. His ears are wired and he has oversized large back paws, tiny bright eyes and a hand embroidered nose, a sheer ribbon accessory has been added to complete his look. 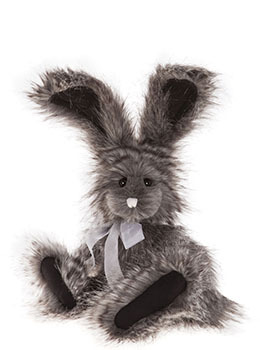 This beautiful Bunny Rabbit is Fully jointed and hand finished and Surface Washable and Suitable for 3yrs + .